As all of these ideas are personal preference I understand that I/we (my server) may be on the outside of the popular opinion on this one (AFK ALT-TAB). The few posts/suggestions on r/Minecraft and r/minecraftsuggestions have been rather 'hostile' to empathy for the old F11 AFK. Oh well, it may have taken roughly 9 years of playing (after migrating away from Dwarf Fortress), but this may be the solid line of "When [this Minecrafter] became a crotchety old player." If so, I hope the "1.9 Combat" group will accept my late coming to this party.Will MC survive, you bet-cha! Will it annoy a few, probably. Will players adapt, 100% (I Already have...kinda)Your thoughts and opinions? Definitely hope they decide to reverse this decision, we used that bug for a ton of things on our server. I'm with ya 100%, Though since it's a bug...I don't think that'll happen! With how many videos there are for "AFK" farms I'm really surprised this hasn't blown up in the community yet. You can still afk with a heavy weight on the keyboard. And caps lock works on mac. But the F11 trick was nice. Probably because we build the too-big farms and don't actually need to AFK. Likely the only time that technical ignorance turned out to be a good thing. You can still afk with a heavy weight on the keyboard. I've been AFKing that way for ages, didn't realise there was another way! I just open the crafting/inventory window then alt+tab out to have the game work while I am afk (game will not pause while you have crafting window open) but I think opening the game to lan makes it so the game can not pause regardless if you are alt+tabbed out which would make that an alternate option as well. I just open the crafting/inventory window then alt+tab out to have the game work while I am afk (game will not pause while you have crafting window open) but I think opening the game to lan makes it so the game can not pause regardless if you are alt+tabbed out. This isn't what they were referring to when AFKing. They were referring to the player continuing to do stuff (like casting a fishing rod). In 1.12, the way that Mojang had coded fullscreen mode was to basically to just resize the game window to the dimensions of the monitor, which would force a screen update. When this update was happening, you could let go of the button and Minecraft would miss seeing the keyup event that tells the game you let go of the button. In 1.13, they changed this so that fullscreen now properly uses the screen object and as a result there's no more screen update. This in turn means Minecraft never misses key/mouse events and will always know whether you are pressing the button or have let go of it. Oh, I call that botting and use my keyboard/mouse driver programs (I have 1 for both) to make macros for that (never knew you could do it another way). However if I did not have those I would just download autohotkey or another free program similar to it. This is not correct; older versions used exclusive fullscreen mode when in fullscreen, meaning that the game had full control of the GPU, as evidenced by the fact that 1.6.4 ran much better in fullscreen on my older computer, which only had 256 MB of VRAM and could run out with severe lag in windowed mode since a lot of VRAM is used to render the desktop, while fullscreen meant that only the game itself was using it, FPS was also higher despite rendering more pixels. This is also why there is a noticeable delay when switching between modes, as well as various other issues (e.g. I've had the game crash when I accidentally pressed the Windows key, which is a very common issue with exclusive fullscreen mode; I jammed the key so this can't happen again. Interestingly, this is said to have been fixed in 1.13 (or was, since people report it still happens, likely related to the bug mentioned next). And org.lwjgl.input.Keyboard.reset() resets the pressed keys. Therefor the keyboard never registers that the keys which were previously pressed are unpressed now. This can be solved in Minecraft by calling the method net.minecraft.client.settings.KeyBinding.unPressAllKeys() before returning from the method net.minecraft.client.Minecraft.toggleFullscreen(). As far as fixing AFK exploits go, I consider AFKing to be totally pointless given that the purpose of a game is to play it, not let it play itself for you; indeed, after seeing the fix mentioned above I'm going to try adding it to my own version, which already severely nerfs most forms of autofarms (good luck making an iron farm when you must directly kill them yourself - even Mojang tried fixing this in a 1.8 snapshot but the outcry from the community was so ridiculous that they "had to" nerf it (seriously, iron is easy to find in caves; I can't even imagine needing half a million iron, and Mojang should be in charge of game development on issues like this); likewise, all other potentially valuable mob drops require player kills, and really, there isn't any reason for nearly all mobs to drop loot unless the player kills them. I also nerfed darkroom spawners by making it so that mobs only despawn within a cylinder, not sphere, so you must light up the surface and all caves, and a given chunk has only half the spawn rate due to alternately choosing chunks for spawning (mainly for performance, since then the time spent on mob spawning, which is the single most expensive server task when idling in a normal world, is halved. this has no noticeable effect on normal spawning, similar to how Spigot servers have issues with grinders due to slowing the spawn rates)). This is also distinct from arguments about 'good citizenship'. While I do not see myself ever spending much time on a server that permited unrestricted PvP/item duping/griefing, neither do I see how I am harmed by those who enjoy play under those rules clubbing together to do so. Similarly, what harm can plausibly be claimed by those playing elsewhere from places like the SciCraft server [where grinding every possible iota of performance out of a build is a widely held ideal] is unfathomable. 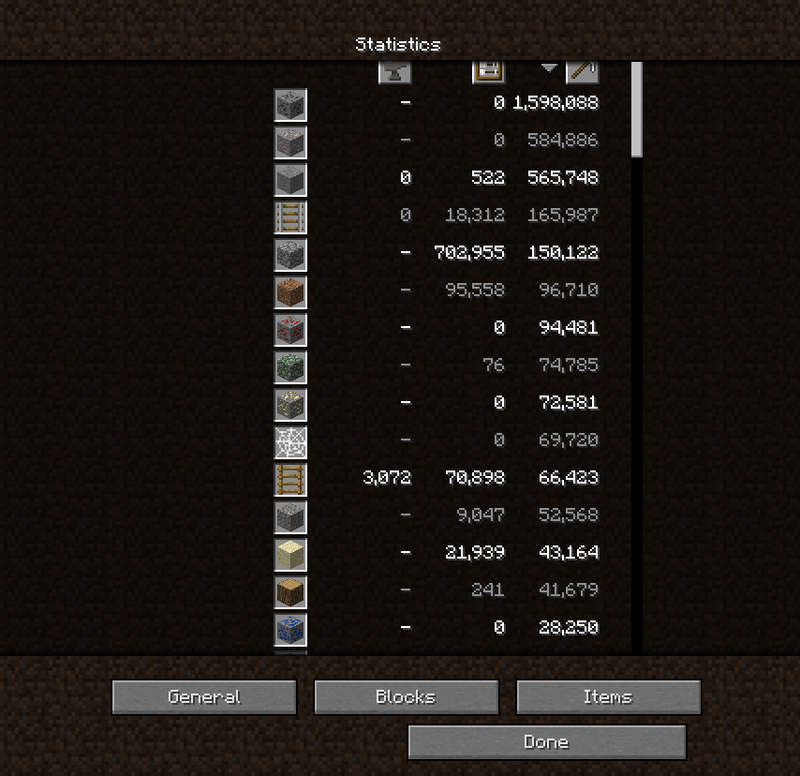 I probably have "only" about 10,000 unsmelted Fe ore lying about a world considerably younger than TMC's [c. 3 chests, plus the odd stack here and there], but about 125,000 Fe ingots stored in block form. The advantage of having this sort of supply is avoiding the meticulous logistical planning for which I don't care [getting more than enough IRL ]: setting off to do a project, one can simply thorw a stack of Fe blocks the 'job-shulker' rather than needing to calculate exact needs (eg. that n hoppers, m iron bars, p levers, and a cauldron [in a pear tree ] will require 237 ingots), thus letting one skip the drudgery and get on with the fun parts. [I'm actualy in the final stages of building an octuple Fe farm (because I wanted fourfold radial symmetry around a former Ocean Monument being turned into a base) and have built 'off-switches' into the farms (as well as the ability to convert each to an infinite villager breeder) to avoid the annoyance of processing all the output.